August 22, 2018 - by NoMoreKoolaid - 24 Comments. Anyway, Riot seem to be doing quite a bit of work to clarify the nature of the Void and its interactions with Runeterra, and in the process we’ve gotten a much more complete picture of who Lissandra is and why she does what she does. So what do you think? 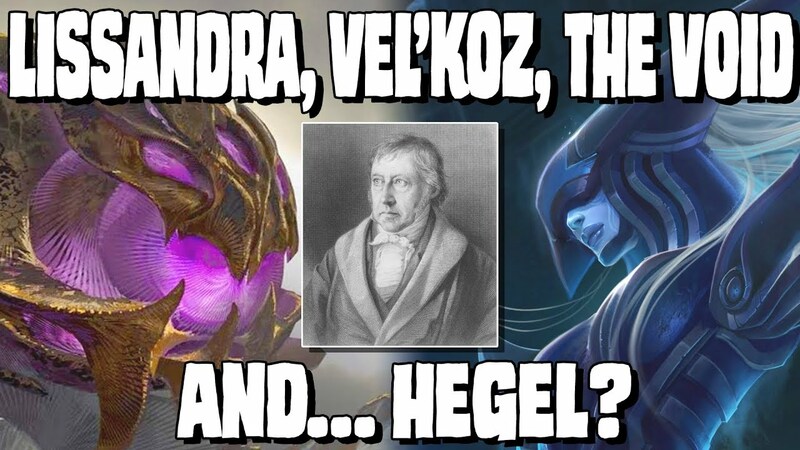 Are Riot gearing up for a Hegelian dialectic between the existence of Runeterra and the nothingness of the Void, or will this be yet another thematic thread that they bring up and don’t ever get around to doing anything with? May all be consumed by the true origin. For the Void. Calling it now, Vel'koz will have a character arc where he learns to love and sacrifices himself for the mortal world. Hey, could you please do a video on Singed? I honestly believe that he doesn't really reflect what Riot seem to want his character to be: A mad scientist archetype, but I'd love to hear your opinion on him! I doubt that the Watchers care about their own existence or sense of being, but I think what would be more likely, is that if they destroyed Runeterra, they'd realize they feel the same thrumming of existence from each other. Information and matter pulled from existence is now integrated into themselves. They are sentient and existent, and so then they might try and destroy each other. And then when all the Watchers are killed except one, it would then realize the same sensation was coming from itself, too quiet to hear over the sound of the others, who in turn were too quiet to hear over the sound of Runeterra. The conception of the Void reminds of the realm of the demons in the Bartimaeus series. A bit of a spoiler, but one time in the series we get an actual despriction of their "Other Place". Its an everchanging stream of chaos, where there are no forms or matter, just "Essence". In this realm the Demons dont have a body. And if i understand correctly, before the first demon was summoned, there werent even seperated consciousnesses. So only in contact with our World, a world of order, the "peaceful" chaos of the "Other Place" got disturbed and the Essence was formed into sentient beings. And the demons truely hate the human wizards for that. Even the discription of pain when entering our world is analog to the pain of Bartimaeus when he gets summoned. Man, this also heavily explains why Aatrox questions if he's destine to become part of the void. On a surface level, that have the same goal; to destroy everything so that nothing else exists. However, the void needs Runeterra to confirm their own existence while Aatrox doesn't. While Runeterra gives the voidborn life, they will ultimately give into destroying it due to their nature. Aatrox wants to destroy everything because it's believe's if everything around him is gone, he will cease to exists as well. He's only ever going to find peace in Runeterra's death; if at all. Aatrox destroys not through hatred but out of the idea that maybe the journey will destroy him as well. Aatrox almost WANTS to be a voidborn; he wants to need Runeterra so that when it's gone; he'll be gone too; terrified of the idea that he's doomed to be a prisoner forever. What interests me is why, according to Hegel, the self becomes destructive towards the other when it becomes aware of it. What is the base for that? This video reminds me of the Auditors from Discworld who, in some odd ways, are comparable to the new concept of the Void put forth by Riot. To put it in short, the Auditors are incorporeal beings – sort of a force of nature like Death – that represent order and logic and rationality. They dislike life, but they hate (insofar as they can hate) sentient life because it can conceive of things like 'love' and 'hope' that have no observable properties yet still cause things to happen, so the Auditors set out to wipe out life. Normally they operate from outside reality like the Watchers, using catspaws to do their dirty work, but the one time they go INTO reality by forming human bodies and possessing them, they go… insane. Their perfectly logical worldview is completely shattered by being in a body that feels, so much so that eating anything with a rich enough taste (like chocolate) kills them. By becoming a part of reality, the Auditors defeat themselves. It feels like something similar is happening to the Void creatures that live in Runeterra: now they have corporeal bodies and a vast playground full of things to hunt and consume, so if it actually came down to it and the Watchers said 'okay guys it's time to press the button that will end everything go and do it', would they comply? Or are they so enamoured with being alive that they'd tell the Watchers to go stuff themselves and just continue rampaging about eating things? 15:08 is this an evangelion reference? This reading of the Void reminds me a bit of KADO: The Right Answer (before it went all wonky). Yaha-kui zaShunina and other anisotropic beings are more interested in and benevolent towards the real world, but there's still that idea that the other realm's immensely-powerful beings are incomplete or otherwise lacking, that they want or need to consume information about our world, to understand it, to fill that hole in themselves. Does anyone know the outro song? 9:11 all we need is Jo Jo! Does anyone know the song playing at the start of the video? If existence itself scrapes the form less consciences of the void I wonder how they feel about Kai'sa. If they can feel her presence all the time wouldn't they be even MORE desperate to eradicate her? Or is it that her suit actually masks part of that? How is she even able to survive in such an environment? Here's the thing, the new void feels like it doesn't fit anyone but vel'koz. All the other void creatures/characters feel way more like aliens from a physical place while this is talking about another plain of existance.